M.O.O. 1+2 and 3 are 60% off at GoG.com for anyone who wants to play the inspiration. I purchased MOO2 several years ago because of this web comic, it was an excellent investment. It makes me wonder what other great works of art (not just video games) are out there which I have not heard of. If 4x games are your bag, pick up galactic civilizations 2. I think the game with expansions can be had for less than $30 now. Also give the "Ur Quan Masters" a try, it's a free to download game and now they've released an "HD" version of it too if you prefer the look of that. Oh come on, Moo3 is a perfectly good simulation of a spreadsheet! I had some good fun on MOO3 using multiplayer with a friend. Some of the different design mechanics within the game were good, but only to a degree. I will concede that MOO3 doesn't hold a candle to MOO2. Its just a shame MOO2 can't be played to the galaxy scale that MOO3 could. http://en.wikipedia.org/wiki/Sins_of_a_Solar_Empire <---- was buggy as hell when it was released, a few patches, expansions and years later it's actually pretty good. http://en.wikipedia.org/wiki/Sword_of_the_Stars <---- some people swear by it, I'm not one of them. http://en.wikipedia.org/wiki/Galciv <----- a entire series, again some say it's wonderful, i found it rather 'meh'. http://fractalsoftworks.com/ <----- a game mentioned in the 'mod' thread, not a 4x but interesting and fun anyway....despite it being alpha stage. http://en.wikipedia.org/wiki/Star_Wars_Rebellion <--- directx 2 old but still fun....despite it being impossible to fight tactically forcing you to just 'let AI handle it.' and giving you a result. Hm... Stardrive, Fragile Allegiance, FreeOrion, Star Trek: Birth of the Federation and Imperium Galactica maybe? But MOO2 is still my favorite, I have to admit. botf was kinda nice, reminds me of rebellion but i preferred the wars version, i did play imperium galactica....two i think, pretty nice but felt rough, like they had a deadline and never really finished it. stardrive seems pretty cool, and has free orion gotten past alpha yet? Given what it is, I assume that even if FreeOrion gets a thousand full-time developers for ten years, that it will have a fully-featured voice, text, and holographic interface, including instructions on how to construct the hardware for the holointerface for thirty dollars on your kitchen table, as well as a friendly and gentle post-human strong AI that helps you play, yet will still be in alpha. Also, it will be capable of making toast. Open source can be like that, sometimes. But will it grant us the bounty of an envelope full of pure dirt? Another one for your list Discord would be Stars! Well, there would be Ascendancy to add to that list. Haven't played that in a while and it seems that I have lost my CD version. Was a very nice game back then and I really liked the music. However, it was not turn based, if I remember correctly. I still wish Supernova was finished. If you're going to play MOO3 I recommend setting immigration off in Population.txt, specifically the Distance to System per jump line(set the value to -999 so immigration drops off after 1 jump). I've found that this radically decreases the processing time for turns, as well as produces less crappy planets for the ai. 66% off on Steam today only. I've been meaning to pick this one up. Thanks for the tip, Fred! Pardon the necroposting, but I seem to have overlooked this thread. I don't think I can accuse this webcomic having sold me on any games. However the inverse case did happen. Homeworld lured me to Arioch's webcomic, and it's a space strategy/tactics game I would recommend (real time, mind you). The sequels are good too, especially the last one, IMO HW2 has an actually humane user interface. 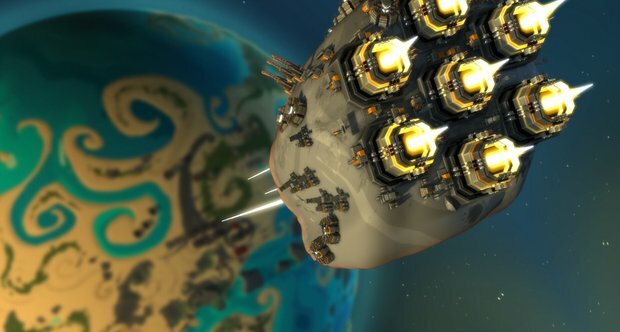 For those of you interested in Homeworld, if you haven't heard of it before, there's a new game coming out soon called Hardware: Shipbreakers. The head of the development house doing it (Blackbird Interactive) is Rob Cunningham, who was the art director on Homeworld 1 and 2. As you could probably tell from the distinctive art style. It's a Facebook/browser game, and I was part of the alpha testing group; I didn't play it for very long, because... it's a Facebook game (and therefore targeted at "causal" gamers"), and there wasn't much "there" there. But admittedly I haven't played it in a long time, and it certainly seems that the graphics have improved a lot since I last played. I'd like to point out that they were only using facebook as their means of managing their testing group, and stand-alone test versions distributed through Steam happened a little down the road. They do seem to be aiming at a free to play model, but that doesn't categorically rule out a less casual take. I had a similar impression of the gameplay, myself, but I also wouldn't rule out polish making it shine. but i most admit it reallly really look like homeworld. Hell at first i tough that the crashed ship was the Sajuk'kar (or how ever you spell it) little brother. but from the way i see it i doubt it is a facebook game, look quite like an RTS to me. A little outside our normal discussion here, but Arcanum is on sale at GoG.com, it's unbalanced and buggy, but a blast and I highly recommend it for the price.